Depending on how old your children are at the time of your divorce, it can be easy to forget about the cost of college when negotiating child support in your divorce. The situation can get tricky because a court may rule that your former spouse has no legal obligation to pay for college if you seek contribution at some time in the future. If you want to ensure that your spouse helps shoulder the burden of college costs, then those costs must be negotiated in your divorce settlement. Here we are going to look at how divorcing parents can come to a fair agreement about paying college costs without adding even more stress to an already stressful situation. There are several ways that couples can address college during a divorce situation; they range from ignore it and deal with it later to split it all right down the middle. Not planning for college at all is a common response by parents of young children. They choose not to address these costs at all because they view it as being so far in the future that it is impossible to predict their financial situation. The trouble with this option is that when the time comes to discuss college costs, you may have to go back to court and obtain a ruling from the judge if you and your ex can’t come to an agreement on your own. Divorced parents can utilize college savings plans just like any other parent. If college savings plans are in place, that money can be applied to college costs first, before the parents contribute anything. 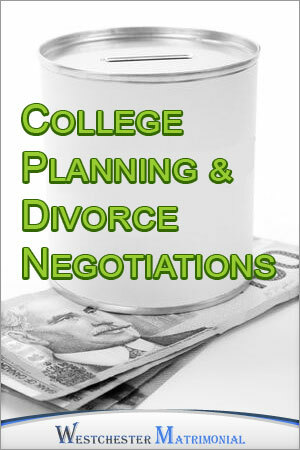 Be aware that there is no obligation to contribute to a college savings plan unless it is specifically negotiated in the divorce agreement so if you want to use these programs, make sure you negotiate it. If your child has obtained loans, scholarships or grants, these can be applied before your obligation for college kicks in and could substantially reduce or even eliminate your obligation for college. Another way to pay for college costs, and probably one of the most reasonable and fair, is to set caps at a certain amount. This amount represents the maximum amount of money that each partner will contribute to college. In New York, many couples use SUNY caps to determine these amounts. SUNY caps limit the parents’ college financial obligations to a pre-determined percentage of the cost of a State University of New York (SUNY) school. This represents the parents’ full costs, no matter where the child ultimately ends up going to school. Once the set caps are met, any remaining needed funds must come from other sources. Some parents are in complete agreement that their children will go to college and agree to split costs 50-50 or in proportion to their incomes at the time of the divorce, no questions asked. While noble, this can lead to out of control costs that both sides can end up resenting. It can also end up being unrealistic, if one or both parents can’t afford it when the time comes. There are a few situations that need to be taken into account when designing any college payment plan. Financial circumstances change. In some cases, a parent’s financial situation may change and they are making less money than they were before. If the change is substantial, you may need to go back to court to have the agreement adjusted. But be aware, what you consider substantial and what a judge considers substantial may not be the same thing. You may still wind up having to pay the previously agreed-upon amount. Child support payments. NY residents pay child support until the child is 21. They can also pay until age 22 if negotiated and assuming the child is in college on a full-time basis. If the child is in college and you are helping to pay room and board for college, you can negotiate a credit towards your child support. The amount of the credit would typically be the amount you are paying for college room and board. This saves you from paying double costs. No college, no obligation. If the child does not go to college, parents are under no obligation to follow the college payment agreement. College costs extend way beyond tuition. Use this checklist to ensure all college-related costs are covered by your divorce agreement. Again, be sure to negotiate a cap on expenses to keep them from getting too out of control. Your agreement should include all reasonable college expenses, but does not need to include funds for the child to come home every weekend, for example. Like every other co-parenting issue in divorce situations, the best all-around results come when parents cooperate with one another – and there is plenty of opportunity for that. From college costs to filling out financial aid forms, even deciding where a child goes to college, the need for cooperation is great. And there’s no avoiding it because when it comes right down to it, you can negotiate college now or in the future.